Sheets of popular music, marketed as Sixpenny Pops, were a special favourite at Woolworth's British and Irish Stores in the early days. 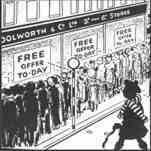 For sixpence (2½p) shoppers could buy a single popular song, or a whole book of standard classics. One of those songs proved particularly popular with the staff at Woolies. "We Will Have a Woolworth Wedding" poked fun at the Company when the Founding MD's son Norman Bailey Woolworth used some of the riches that he had inherited to finance a wedding at Westminster Abbey. It speculated that he would furnish the matrimonial home with items from the counters of the Threepenny and Sixpenny Stores. We've reproduced some of the lyrics, and an instrumental of the tune, on this page. 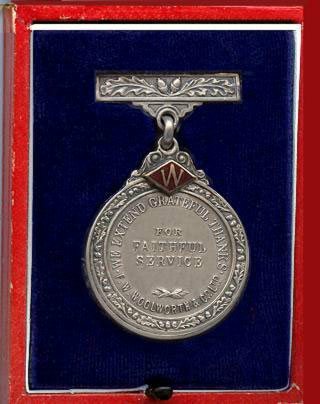 "We'll have a Woolworth Wedding"
Buying Superintendent John Snow's biggest success of the late 1910s and early 1920s was a range of "sixpenny pops". He nearly cornered the market with the sheet music of the hits of the day. The British stores enjoyed even greater success that Frank Woolworth had achieved when he first launched a music range in the USA. Our favourite is "We'll have a Woolworth Wedding". 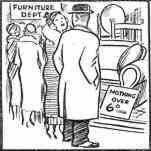 R. P. Weston and Bert Lee's describe the kinds of things sold in the High Street stores in the roaring Twenties, with a bit of a twist. The duo wrote many hits, and are most famous for 'I'm Henery the Eighth I am, I am'. Here's are some of the lyrics of the Woolworth Wedding song, which you can play using the HTML5 player below. Johnny said to Mabel, "Guess I shan't be able To marry you this year. Tho' I love you, honey, I'm so short of money, And furnishing's so dear." Mabel on his shoulder said, "'We're getting older". Tears were in her eyes of blue. Johnny said "Don't cry dear, I've struck an idea. I will tell you what we'll do." We will have a Woolworth wedding, Sweetheart, you and I. 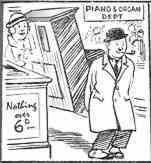 Everything except the grand piano Down at Woolworth's we can buy. We'll get a suite, a sweet little suite of doll's house furniture. A sixpenny set is all you can get in the houses where we are! 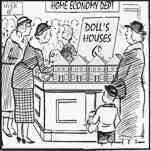 we'll buy a sixp'ny ha'p'ny baby doll at Woolworth's bazaar. 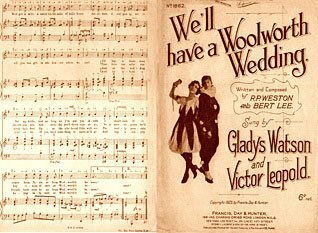 © Copyright 1923, Francis, Day and Hunter - "by agreement with F. W. Woolworth & Co. Ltd."
You are listening to the melody for "We'll have a Woolworth Wedding"
and presented us with Simon's recording especially for the Woolworths Museum.